Elizabeth Criss met her first art critic in kindergarten. After painting what she thought was a fitting tribute to a weekend wedding, she was eager to share her vision with the class. But rather than display the portrait, her teacher instead pointed out how she failed to give the bride nostrils. Undeterred, she still pursued her artistic interests. Unfortunately, she was so fearful of critics, that she hid from the professor during her first college painting class. When critique day arrived, she slipped her canvas into the line-up of freshly painted images and ran away. The process was so traumatic that she ultimately broke the painting into pieces and tossed them down the dorm's trash chute. A lot has changed since then. Most notably, when she went to enroll her daughter Emily in school, she encountered brown walls, brown floors, brown ceiling, and an acid yellow Formica trim. This would not do for the child, who had profound challenges and a minimal ability to communicate. Emily had brought her mom to a grand canvas, where endless walls screamed, "PAINT ME!" Elizabeth spent nearly a decade embellishing those walls with engaging textures and bright colors, designed to improve the daily lives of students with significant challenges. In addition to her work in special education facilities, Elizabeth's art installations are featured in public libraries and other civic buildings. 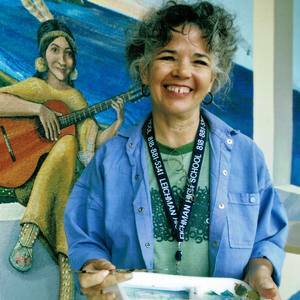 While working as a public artist, she developed her vivid palette, versatile assemblage techniques, and an engaging visual vocabulary. Best of all, she now has a true appreciation for her critics and looks forward to learning from their perspectives.